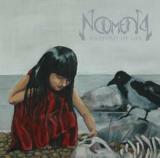 On their third and latest offering, Noumena found their niche and blasted a glorious slab of melodic metal fused with death vocals and mounds of folk elements. Antti Haapanen still has the gut checked with full force as the growls spew forth in a mighty, deep fashion. Hanna Leinonen is still aboard providing the smooth, powerful clean vocals that mix in beautifully with the gutturals. Tuomas Tuominen is at hand on few of the tracks to bring a softer male side as well. The countering colours of these voices still work extremely well together. The music has become slightly more epic and anthemic from the previous release, Absence. The brilliant production supports this notion as even the drums are at full blast – literally. The still evident vibes of older Amorphis are there in the moodier, slower tunes but there is more of the modern, speedy bashing reminiscent of the Swedish melodeath greats of the 90s. The leads and harmonies continue a catchy path and the down-pounding riffs have more weight in them. However, the melodies form packages that have become increasingly more complex and demanding of repeated listens to open up entirely. I hesitate to call it progressive touches, but the song structures are more thought-out and tighter. The need for more fast tracks was heard loud and clear as Retrospection and Triumph And Loss (my favourite off the album) roll on with head-on attitude. On the other side we have the mid-tempo grinders like Monument Of Pain and Through The Element, that mix in mellow, melancholic moments that jerk out tears almost as well as the best Evergrey-ballads. The closing track Fire And Water flirts with some doomy, dragging riffage that actually works out great. Anatomy Of Life finds Noumena fulfilling their potential to a certain degree, which should be highly enjoyable for anyone into some folky metal with several vocal stylings in use. I do not think for a second that the band has used up all of their innovations, so I will still hold out points for the future, when hopefully the speedy injections are even more frequent and the choruses slightly hookier.